Automated external defibrillator use: What are they and how are they used? AEDs (or automated external defibrillators) are battery operated portable devices that provide critical medicare in the event of a cardiac arrest. They are simple to use, in fact, it is quite possible for someone without any training whatsoever to use it properly the first time and successfully revive a person in the event of a medical situation. AEDs detect abnormal heartbeat rhythms through the two shock pads that are placed at the top left and bottom right of the patient’s torso. Once in analyzing mode the shock pads detect what kind of heartbeat rhythm the patient has, which determines whether or not a shock is needed to re-establish a normal heartbeat rhythm. Ventricular bradycardia: Heart beat too slow, abnormal. Ventricular tachycardia: Heart beat too fast, abnormal. Ventricular fibrillation (or v-fib): Rapid, irregular heartbeat rhythm. AEDs detect the heartbeat rhythm of a patient. If the shock pads detect an abnormal heartbeat rhythm (bradycardia, tachycardia, fibrillation), the AED will charge up to deliver a shock to the torso are an effort to re-start the heart and re-establish a normal heartbeat rhythm. It is a common myth to assume that a defibrillator will shock the heart when it is “flat line” in order to re-establish a heart beat rhythm. The truth is, the AED doesn’t deliver any shock if asystole is detected. In order to re-establish a heartbeat rhythm again, manual CPR compression is needed. Paramedics can also inject adrenaline drugs in the body in order to stimulate electrical activity in the heart in combination with manual CPR compression and oxygen administration. 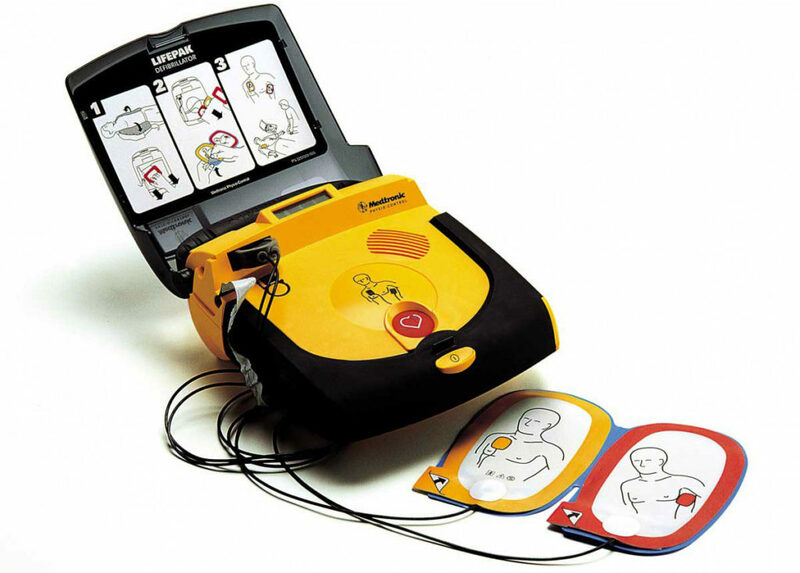 Do I need training in order to use an AED? AED is on and initialized. Remove clothing from person’s chest. Attach pads as shown on the diagrams on the shock pads. AED in analyzing mode and to stand clear of the body. AED determines whether or not a shock is needed. If needed, it will charge up. A warning sound will sound off and another alert to stand clear will be given. Instruction to push the shock button. Perform CPR compressions for 2 minutes. Pushing the shock button when someone else is performing CPR. Pushing the shock button when a bystander is touching the patient. Pushing the shock button when a body part is still touching the patient (i.e. knee touching patient’s torso). Pushing the shock button when a body part is too close to the patient. Failure to tell crowd around the patient to stand clear when delivering the shock. Improper sequence of AED use (i.e. plugging in connector first, turning on AED last). Distraction from bystanders, causing a disruption in concentration. What to do if the patient is pregnant. What to do to if the patient has excess chest hair. What to do if the patient has jewelry or metal framed bras. What to do if the person is too wet (i.e. just came out of the pool). What do to if the person as an implanted defibrillator or pacemaker. 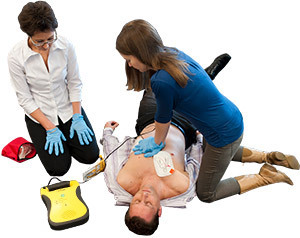 The Academy for First Aid and Safety of Toronto can deliver comprehensive theory and hands on training for automated external defibrillator use so you can use an AED confidently in the event of a cardiac arrest emergency. Regulation 1101 of the Employment Standards Act of Ontario has made AED use a mandatory subject when employees obtain their first aid and CPR certification. The Academy for First Aid and Safety is a registered and certified training partner with the Canadian Red Cross Society. We deliver hands on, comprehensive first aid training courses (including CPR, AED use) which meet the provincial requirements as outlined from WSIB of Ontario and the Ministry of Labour. Our academy services the greater Toronto area including Mississauga, Brampton, Hamilton, Vaughan, Richmond Hill, and Markham. EVA foam flooring at The Academy For First Aid and Safety of Toronto!